the illustration, to an exceptional degree, of the ideals of the Renaissance and the Age of the Enlightenment on western European thought and design. The brand “Qualité tourisme” (Quality Tourism), led by the French State, selects and federates under one badge all quality initiatives for your satisfaction, in the entire tourism sector. It guarantees a personalized information, available and competent professionnals, and quality services rooted in their territory. 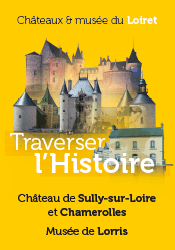 Check the map of others sites in the Loire Valley that meet the standard. The brand “Accueil Vélo” (Bicycles welcomed) is owned by Vélo Tourisme and the Tourism Regional Comity. It allows tourists to identify institutions and places adapted to bicycle tourism, and thus to expect appropriated reception and services. For instance, professionnals must be located less than 3 miles (5 kilometers) from a bikeway, marked and secured (according to the national specification for bikeways and green ways). The label “Maisons des illustres” (Illustrious’ Houses), from the French Minister of Culture, aims to identify houses saving and transmitting the memory of men and women of notable importance in the political, social and cultural history of France. The Castle of Sully-sur-Loire is one of the 111 labeled houses.